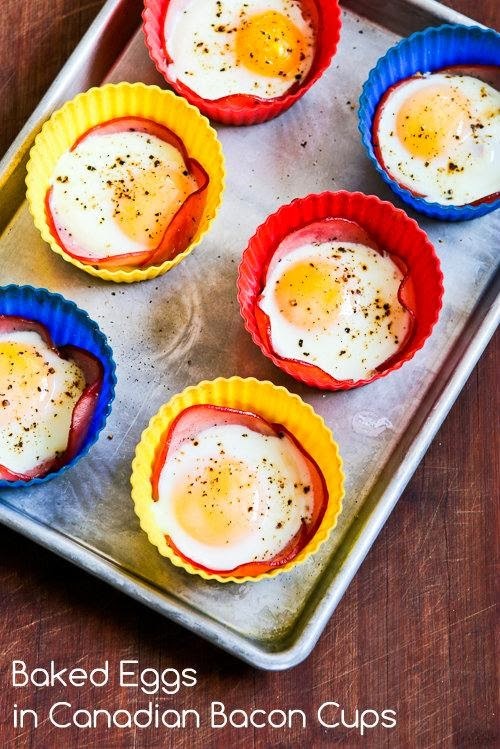 Baked Eggs in Canadian Bacon Cups is a fun idea for a low-carb breakfast! This recipe for Baked Eggs in Canadian Bacon Cups came about when I was hit with of those spontaneous creative cooking urges that pop into my mind, inspired by a package of Canadian bacon I'd purchased from Costco. I thought this was such a fun breakfast idea, and Canadian bacon is low in fat so it makes a healthy breakfast that would be appealing to kids as well as nice to to serve for guests. I ate mine with a piece of whole-wheat toast to dip into the egg yolk, but if you wanted a low-carb or gluten-free breakfast idea this would also be delicious without the toast.